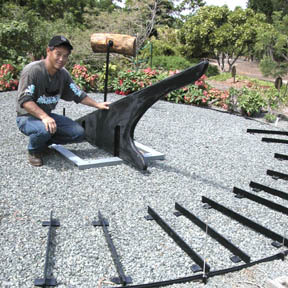 Steve Nagano kneels next to a sundial in the Children's Garden at the Urban Garden Center in Pearl City. The Children's Garden, which is having its grand opening Aug. 28, offers an opportunity to learn about the natural world through various gardens and craft stations. Visitors can make such things as a sundial, a dolphin medallion, a butterfly ring and basket, and catch and bag a fish.